Click for a larger version of the flyer! So Mtkidu are hitting the streets this December to tour the country and show you what they’re made of! 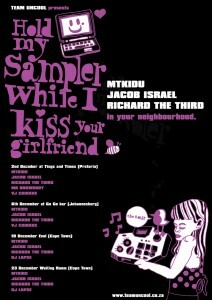 Joining them on the tour are electrotrash favourites Jacob Israel and Richard The Third! Keep tabs on Mtkidu’s Facebook page for more details!